Have you ever found yourself plagued with worry? Maybe even putting off your time with God in lieu of the never-ending to-do list that comes face to face with insufficient time? Friend, I’ve been there. It has robbed me of peace and left my soul unsettled. If you can relate, then you’re going to enjoy today’s guest post by my sweet friend, Ginger Harrington, author of “Holy in the Moment: Simple Ways to Love God and Enjoy Your Life.” I hope you’ll grab a mug of coffee or hot tea, put up your feet for a few minutes today as we visit with Ginger about one simple way to settle our soul. I pray you will be blessed. It’s early in the morning, the quiet hours before the hustle of the day begins. Already my mind scatters in ten directions. Errands to run, deadlines to meet, and problems to solve. We’ve all had mornings (days and nights too) when worries weigh heavy, robbing us of peace. What are the stressors in your life today? We all need to remember and believe that God knows what we need and cares about the small details as well as the big issues in our lives. These two words open the door to peace in this moment: “For your Father knows what you need before you ask Him” (Matthew 6:8). We’ve had our days of scurrying after the troubles that ignite fear, anxiety, or depression. Today God reminds us to seek first his kingdom and his righteousness. Not because the other things aren’t important, but because he wants us to know the peace that comes when we have confidence that he’s got our “all these things” covered. What ever they may be. God reminds me to focus on his goodness before worrying about my problems. Seek first. More than the basics. More than the best we can give. More than the stones and snakes of our problems and needs. More than enough. So much more. So let’s reach beyond the surface and the simple. Let’s stop worrying about just surviving. Let go of the scarcity mindset of scrounging up just enough to scrape by. How much more does God desire to give you right here in the midst of all the challenges? How will this day, this problem, or this fear be different when we put our attention on something more than worrying about the things the rest of the world chases after? His kingdom and his righteousness–these are the first things. • If we get it all done and have time left over, then we’ll seek God. • When all else fails and there’s nothing left to do, then we’ll pray. • When we’ve worn ourselves thin with worry, then we’ll pursue his way of living. God is the adder of all these things. 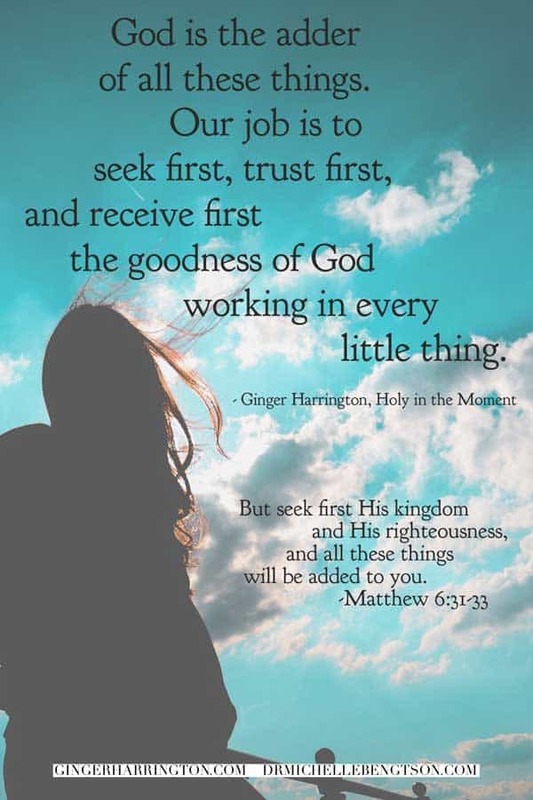 Our job is to seek first, trust first, and receive first the goodness of God working in every little thing. One simple way to settle our soul, seeking God first is our holy choice that opens every moment to the goodness of God. So much more than a religious version of perfectionism, holiness is a secret to enjoying life with freedom and joy. 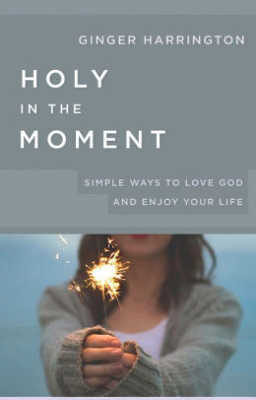 Dispelling the perception that holiness is a standard of conduct rather than a gift to receive, the award-winning book, Holy in the Moment includes Ginger’s personal journey in finding help and hope for anxiety as well as biblical insights, and simple ideas to enjoy a deeper life and freedom in our identity in Christ. Offer your moments to God and trust Him to make you holy and whole, living well in the choices you make today. Read a sample chapter here. 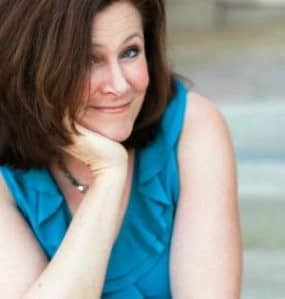 A top 10 finalist in the global Author Academy Awards (click here to vote for the religion category on page 11), Ginger Harrington is the Publishing Coordinator for Planting Roots and the author of Holy in the Moment: Simple Ways to Love God and Enjoy Your Life. 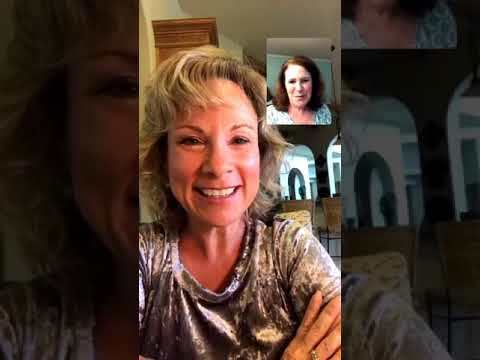 An engaging speaker for military and civilian audiences, Ginger’s newest project is editing the upcoming devotional Free to Be Brave: Moments with God for Military Life. Ginger and her retired Marine husband have been married for 28 years and have three young adult children. Visit www.gingerharrington.com or connect with her on Facebook or Instagram. God intended for us to not worry about anything but to seek Him first and He would give us all these things (including peace). Leave a comment below sharing with us one simple way you have settled your soul and you will be entered into a drawing to win one copy of Ginger’s book, “Holy in the Moment: Simple Ways to Love God and Enjoy Your Life.” You could also share this blog post on Facebook or Twitter then comment here to tell us where you shared it and you’ll also be entered into the drawing. The winner will be selected at random and announced next Monday, October 1, 2018, here on this post. Continental United States only. Listening to praise music always lifts my spirits and helps me to “settle” down whenever I am worried, etc. Me too! There are so many wonderful worship songs to listen. When I’m unsettled, music calms my heart. Blessings! Deborah, it seems you and I are not alone in that. Several have mentioned the power of music to settle our spirits. Thanks for visiting the blog. I hope we see you again soon. Even just this little bit helped. Yes, calming down long enough to tell my mind to seek the Lord first. So pivotal in changing the trajectory of my day. Sometimes just clinging to one verse and reminding myself to BREATHE is what gets me through the trials. Thanks for this post! You are so welcome, Holly! I’m glad God encouraged you through these words. I am finding the more I practice seeking God first, the more it begins to happen without realizing it. May God continue to give you peace. I’m so glad you visited the blog, and that you benefited from Ginger’s wisdom and experience. I hope we see you again soon! Thank you for this post today, Ginger. I’ve been wrapped up in worry and need to settle into the moments today. Anxiety and worry are a struggle for me and I find the best way for me to alleviate the tightness in my chest and roiling in my stomach is to soak in the word where I’m reminded of His love, care and more-than-capable-need-meeting for my dear ones. Tammy, I’m praying for you. It’s so difficult to got through times of great anxiety. I wrote about my struggles with anxiety in my book. Even though I hate feeling anxious, I run hard after God in the midst of the challenge. Thank you for your kind words about the book. Be blessed and thanks for joining the conversation. You are not alone, girlfriend. Aren’t we glad that God gave us everything we need in His word? Because of Him, #PeacePrevails! I help my soul to settle by listening to gospel music during my day. It speaks to me as it is the kind of music I heard growing up. The words tell me about my precious Savior and all the gifts He gives me. I love that the songs you grew up with still speak to your soul. Music is so powerful. We are so blessed to have so many kinds of Christian music to enjoy. Thanks for chiming in the conversation, Carolyn! I find that praise and worship music helps settle my soul, Carolyn, so it looks like we aren’t alone in that. So glad you visited the blog. I hope we see you again soon. My prayer life changed dramatically when I realized I should be asking the Father what is on His heart in my anxiety and everyday turmoil. I began praying His will in every situation, often praying in the Spirit as my soul reached out to Him. And in starting each day that way, I find peace in the midst of every storm. What a powerful insight, Suzi! I’m going to remember to ask that very question. Thank you for sharing such a powerful and practical strategy. This post drew my attention so quickly because I follow Dr. Michelle but also because Matthew 6:33 is part of our ministry name!! It is our LIFE VERSE!! It is our daily desire as we pray morning and night for many people to ALWAYS Seek God first and we know that He will add ‘all these things’ to us: peace, rest, wisdom, discernment and on and on!!! So thankful for Our God’s direction and purposes in our LIFE!! Thank you Ginger for writing such a ‘NOW’ needed book and thank you Dr. Michelle for sharing this blog and the book. Wonderful blessed encouragement!!!! Karen, what a wonderful name and focus for your ministry! Thanks for sharing your thoughts and encouragement. Prayer warriors like you are making a difference in the world! Thanks so much for visiting Karen. I’m glad you have enjoyed the author guest posts, including Ginger’s. I love sharing the words God has given to others. Getting into God’s word daily thru ‘youversion’ bible app has been a huge blessing for it’s been a great source of settling my soul. I’ve gone thru reading the whole bible twice since I’d started the ‘one-year bible reading plan’ 3 years ago, and the living word of God is powerful and life changing!! Amen! A Bible reading plan is so helpful. I just recently added the Youversion app to my phone. Still exploring it. Tasha, I too appreciate the Bible apps that make it impossible for us to make excuses for not being int he word. I’m so glad you visited the blog. I hope we see you again soon. Thanks so much for visiting today and sharing with others. God bless you! I hope we see you again real soon. I read the first chapter that you graciously provided and it supplied me with much needed encouragement to keep the faith, cling to the Word, and have my umbrella nearby for the drizzle and storms that keep threatening me. Your words and your life speak volumes of how to deal with disappointments and health issues. Faith in the Lord and in the Truth in His Word both anchor my spirit and soul as I have been having upheavals in my marriage. I find that when I look to the Lord and focus on His faithfulness, I find His peace invading my being. 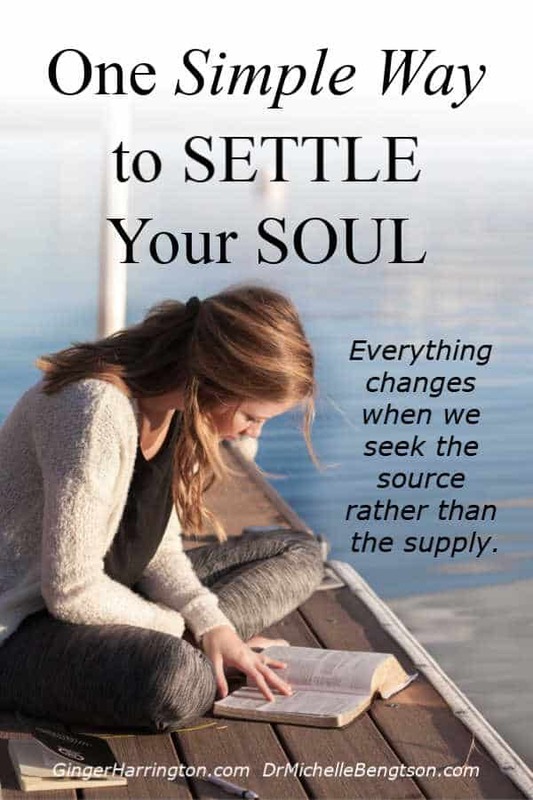 I know your book will bring many readers into a place of stability and contentment as they understand how vital it is to enjoy God’s presence in His Word and prayer. I hope to be able to read the entire book for more inspiration. Thank you for your wisdom in this book. I’m so glad you enjoyed the first part of Ginger’s book! She has a heart of gold and it shines through in her writing. Singing praise and worship songs, or even just the chorus or bits of songs, really helps me. It instantly redirects my focus to God, and praising Him, and then i’m no longer focusing on me or whatever is causing me fear and anxiety. I found the same thing. When I was very ill many years ago and on bedrest, having praise and worship songs play throughout the day and night made a huge difference to me. I’m so glad you visited the blog. I hope we see you again soon. Thank you.This will help me very much. I am going to start praying more. Tara, welcome to the blog! So nice to “meet” you. I’m so glad you found this post encouraging. I hope we see you again real soon. So many trials I’ve faced and continue to face that just plain overwhelm me along with my stressful job. God is faithful and reminds me of His faithfulness specially on those days where it’s hard to stay focus. He tells me to “lean on Him” to “trust Him” that He guides me continually and am not alone. Praising Him even when I don’t feel like it makes such a difference in my life. The praises go up and the chains are broken at the moment, and lives are healed. Taking a breath is a reminder that He lives in me. Applying the “Joy in the Lord” has broken chains from negativity of the struggles in life. I choose to smile my way through times of stress – makes a whole lot of difference in seeing my situation. Thank you for such encouraging words. Jackie, I think you’ve learned such an important truth: that praising Him even when we don’t feel like it really does make a difference. Thanks for sharing! Memorizing scripture and reading encouraging posts like this helps so much. Honestly, it’s a daily struggle for me. I have health issues and the healthcare costs are so huge that we will not be able to sustain paying for them eventually. I get very overwhelmed with it all. Thank you for sharing and encouraging. Oh Jeannie, can I pray for you? Father, I lift up Jeannie and her health issues and finances to you. You are our provider. Provide for her every need, Lord. I ask you to calm her heart and replace any worries and fears with your perfect peace. In Jesus’s name, Amen. I try to start every morning with quiet time. This usually is time where I just talk to God. I thank him and open my heart. I can think of no better way to start the day. Thanks for visiting today. I hope we see you again soon. Lovely post, my friend, and a good reminder as I find myself going up and down the highway from mom to mom-in-law. God uses your words in fresh ways for the weary. So glad to have you here Cynthia. I think Ginger’s post was one that so many of us can relate to! Blessings to you. I hope we see you here again. 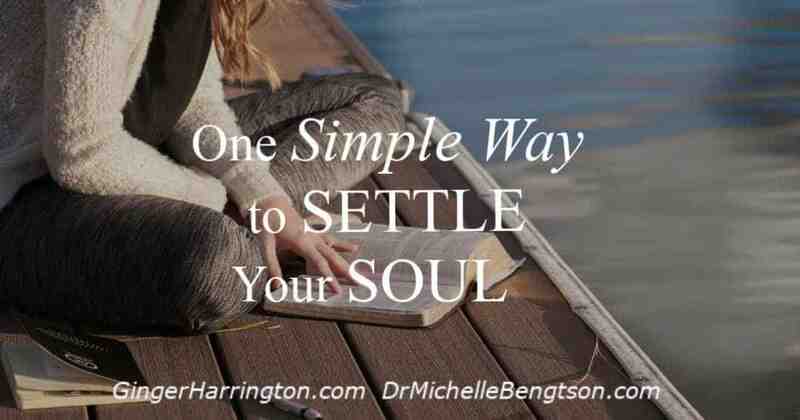 I definitely have to seek Him to settle my soul. He is the God Who sees! You’re not alone Amy. I do too. I’m so glad He’s patient with me. At the end of the day thinking about one good thing that was good about the day. I love that idea Lynn! Thanks for sharing. A sweet reminder of where we are to turn, and why we are to turn to the Source of all. He is the Only calm in the storm, the Only 100% truth-teller. Just quieting long enough to remember and focus on Him is the key. I have done that this morning but one day is not enough. Everyday, sometimes every moment…those are the keys to finding that holiness. I want to be set apart for Him…to Him. Thanks. You’re so right. Focusing on Him is key, yet so hard for so many of us when the world screams all the other things that demand our attention. Aren’t you grateful for His grace? Visiting from #PorchStories. Worry is something I think most of us fight against. Yes, I think that’s true. That’s why I’m working on a book about tackling that very issue. And Ginger spoke to her own struggles with that as well. Isn’t it good to know we aren’t alone? I shared this on Facebook. Music often helps me. It depends on the song and the notes. You gotta be careful because some songs can make you sad. God’s showing me how I’m running myself ragged, so I will be still more. It’s so easy to stretch ourselves too thin. Relying on Christ in the moment makes all the difference. You’re right about the mood of the music you choose. There are times we need to be purposeful in our choices. I try to say at least one good thing that happened that day right before I go to bed.